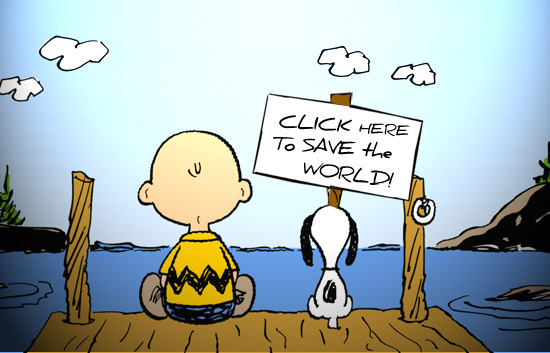 Wouldn’t it be great if solving all the problems in the world was simply a matter of clicking a button? One small contraction of a fingertip muscle and all forms of poverty, famine and injustice would vanish in an electronic pulse through the web. One millisecond later could see us sitting complacently on a wharf with Charlie Brown, watching life drift by in a sea of serenity. Alas, a utopian fantasy that unfortunately does not translate to reality. Whilst we all may dream of effectuating social change, converting this dream into real life actions is another story. Technological convergence has changed the face of activism and facilitated the development of global participatory politics. Social networks and new media are connecting people from all walks of life like never before, equipping citizens with a voice and thus the power to promote social change. But how effective is online activism in creating REAL change? It is undeniable that social networks have helped to coordinate action across dispersed networks, for example in the 2011 Egypt Uprisings, and The American Occupy and Spanish Indignados movements. Social networks are accommodating an alternate method of political engagement, creating a culture in which “ questions of dialogue, dissent, critical engagement and global responsibility can come into play”. In fact politicians have recognised this fundamental shift in engagement and have moved to accommodate it, expanding their campaigns onto social media platforms such as Pinterest to tap into this online pool of political intelligence. Both the Obama and Romney families created pinboards during the 2012 American Presidential campaign that contrasted personal and political content to create an online base to engage the public. However, many argue that online political engagement and activism is “superficial”, lacking the community ties that drive social change. Whilst Kony 2012 succeeded in terms of its ‘spreadability’, informing a global audience of the social injustice surrounding Joseph Kony and child soldiers, it failed in generating REAL LIFE ACTION- in mobilising crowds to bring Kony in. This campaign is a perfect example of “slacktivism”. When fighting for a cause can be as simple as liking a Facebook page, or retweeting a link, there is no cost to participate, no risk to the individual and thus no obligation to see a project through. So while online activism allows for dissemination, coordination and civic engagement, what it lacks is the commitment of participation. However, as Nelson Mandela said “education is the most powerful weapon which you can use to change the world”. The informative benefits of online activism could be the first steps to generating REAL change. Where Kony 2012 failed, others may succeed in the future. While we are all ‘thinking global’, it may take a little time to act ‘local’ or even at all. One day Charlie…, but not just yet. What do these three groups and individuals have in common? 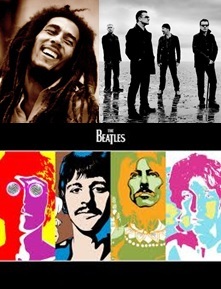 What do The Beatles, U2 and Bob Marley have in common? Even for those of you who are as musically ignorant as me, flabbergasted to discover that classical composer Bach was elegantly pronounced like the wood of a tree as opposed to the very Australian BATCH, you would immediately recognise the previously named groups and individuals as popular musicians. Artists of the medium of silence and sound that provides the background melody to our lives. Whilst you may idolise each band for their individual talents- perhaps Bob Marley for his reggae rhythm and U2 for their rocking riffs-you may not be aware that many of their most popular hits, and in fact almost ALL of the greatest hits of the past 40 years, are based on the same four chords. Take a listen. Welcome to remix culture. A world of “combing and editing existing materials to provide something new”. A world that lives by the French concept of ‘detournement’- changing the direction of a previous media work until meanings are subverted and ‘re-contextualised’. Facilitated by an explosion of technologies created for modifying and distributing these media works, Lawrence Lessig explains that we have shifted from a Read/Only culture, in which we passively consume media content such as music, to a Read/Write culture in which consumers can actively “re-create the culture around them”. In a previous blog I discussed the benefits of a collaborative approach towards creativity. We see further by “standing on the shoulders of giants” as Isaac Newton stated. If we relate this idea to the remix culture of music it is easier to understand the necessity of “borrowing” from previous works. Music is an unpredictable industry in which commercial success is not guaranteed. Exploratory works risk failure, whilst remixing previous songs provides an insurance policy- if it worked before, it will work again. The Amen Break and the 4 Chord progression are only two examples of riffs that have been continually remixed by various artists over the years due to their ongoing success in pop-culture. Furthermore, amateur musicians such as Justin Bieber take their first shaky steps towards fame by producing covers of songs, by COPYING. So while many may argue that U2 ‘riffed off’ the Beatles, Bob Marley, or vice versa, the truth is that this process has been happening on all levels of the music industry since the days of Bach. It is essential to its evolution. Audiences are comfortable with the familiar; we like what we know and, like spoilt children, are hesitant to try something new. Only by building on the success of other artists can musicians guarantee the ongoing popularity of modern compositions.